Last fall, we decided that the deck on the back of our house was in great need of some TLC, so we decided to have it rebuilt (everything except the base) and stained. After getting several quotes, Craig decided he could do the re-building part on his own, and it looks great! So once that phase was complete, we needed to wait a few months before having it stained (we outsourced that part because Craig drew the line at staining a 2-story deck on his own). It’s been quite a process, but it’s FINALLY all done. The semi-transparent stain we chose turned out to not be so transparent after all, but we’re really happy with the color. 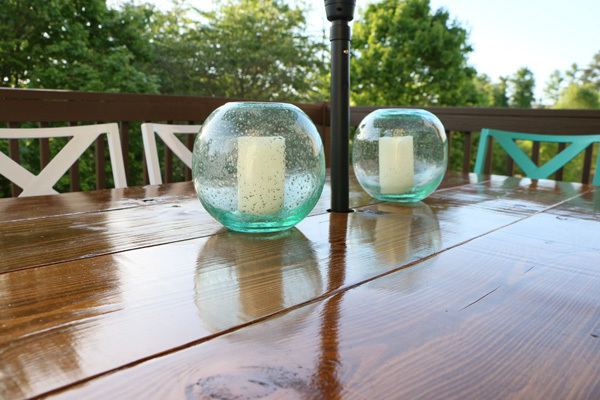 In the midst of the deck project, we decided we’d like to upgrade our Martha Stewart outdoor dining set as well. 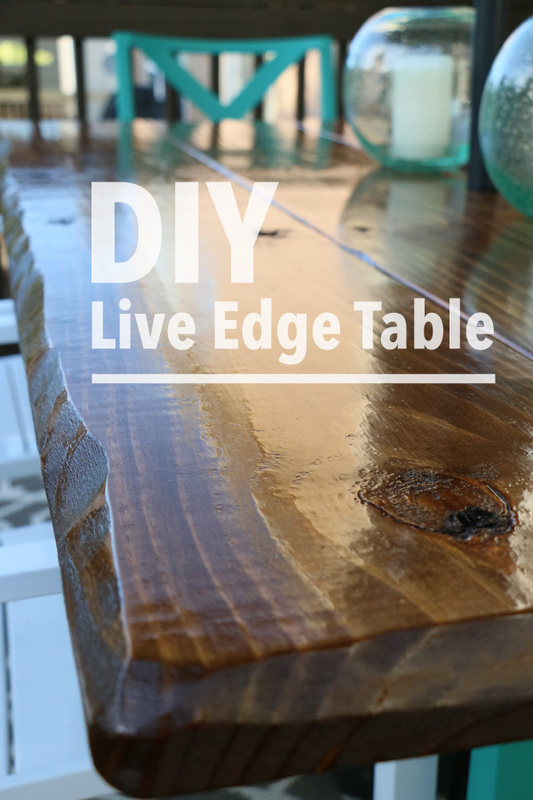 I found a tutorial for a “live edge” table on a blog I follow, The Hunted Interior. It called for reusing the table base from an outdoor dining set, and ours was a very similar style, so we figured we could make it work. The metal part for the umbrella stand had already broken on our table, so Craig just removed the tiles and rest of the metal framing. 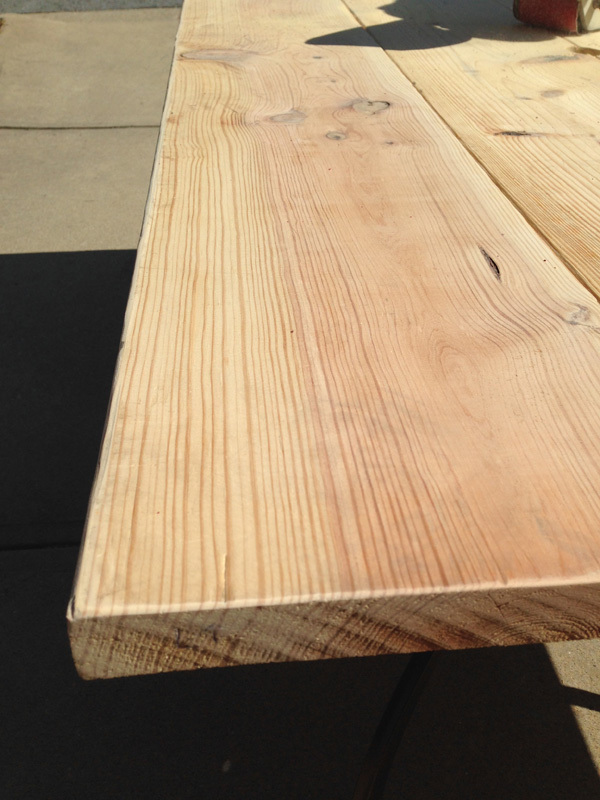 We spent what seemed like forever at Home Depot picking out 2×12″ pressure-treated pine boards that not only looked nice, but didn’t have any warping so that they would lay flat next to each other to make the table top. 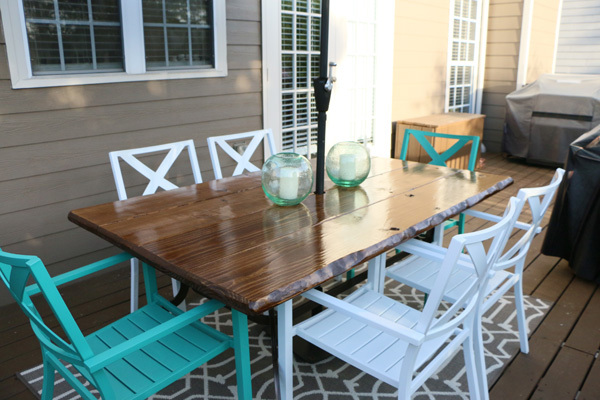 You could use most any size board depending on the width of your table and how much of an overhang you want. I think we allowed for about a 2″ overhang on each side. One thing to note is that when we picked out the perfect boards in the store, we marked them and took a photo so we’d have a reference when building the actual top at home. 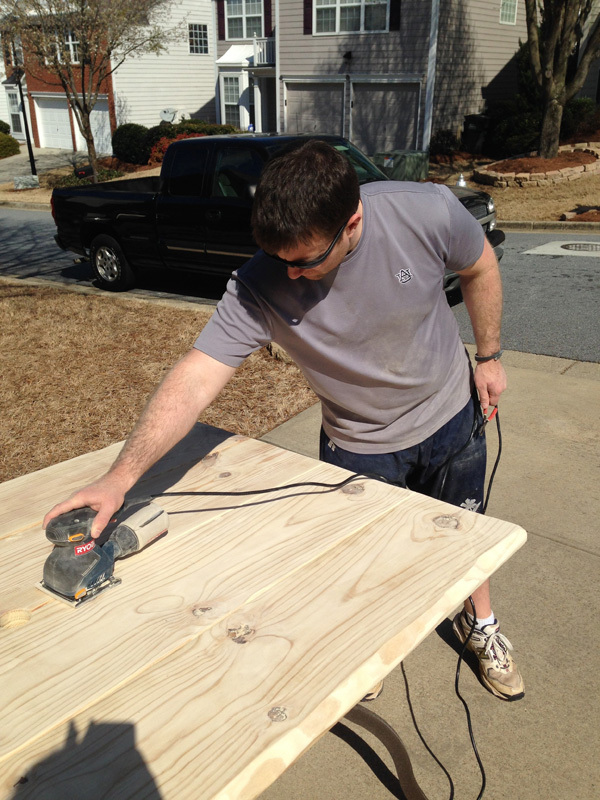 Craig built the table top very quickly — from underneath, he just screwed through table frame and into the boards. He then sanded it with medium and then fine grit paper. Next came the most fun part — using a belt sander! 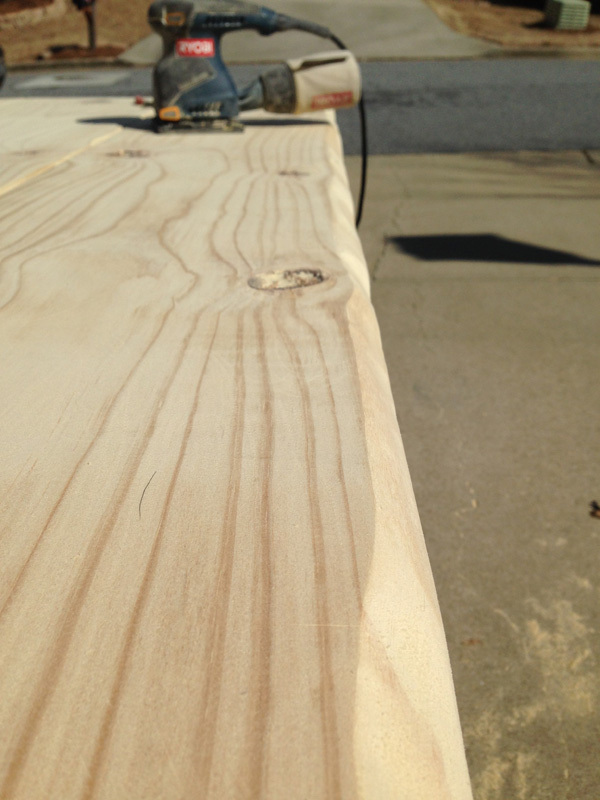 We used the sander to run along the edges of the table, giving it a natural, wavy look. I got in on the action for this, and it really was kind of fun. We didn’t own that particular tool, so we rented one (and bought ultra coarse sandpaper made specifically for that type of sander) for a 1/2 day from Home Depot. We had no idea how long it would take to sand down enough of the edges, but that thing is a beast! We took turns running it along the sides, and we ended up doing the two ends as well so that they’d be a bit rounded and more finished-looking. 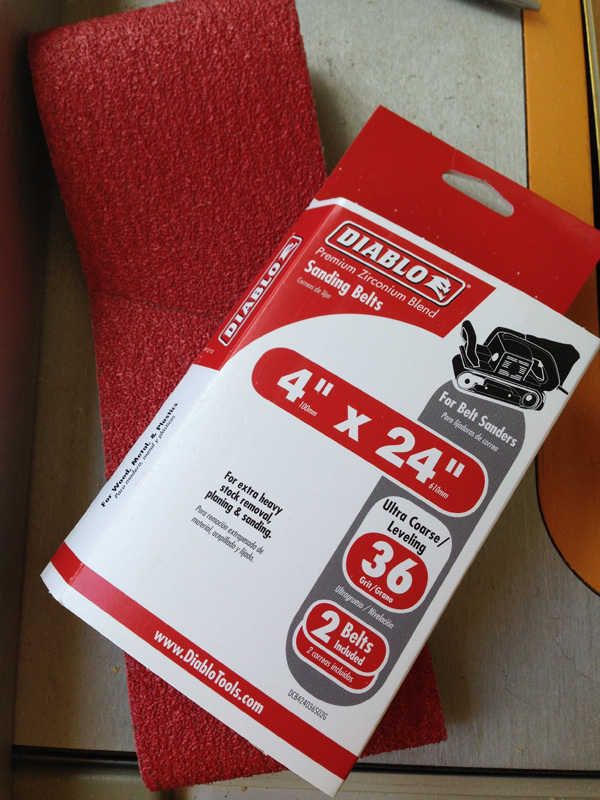 That sander makes a TON of sawdust, so I recommend doing it out in the yard/driveway. In total, we used the sander for maybe an hour. We then did a light sanding over the top of the table again. 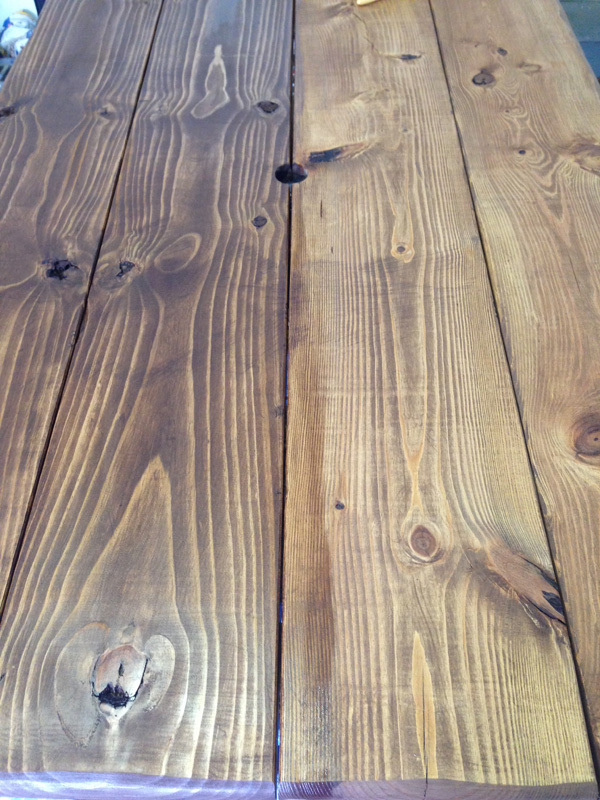 After cleaning the table off VERY well with a wet cloth, it was ready for staining. 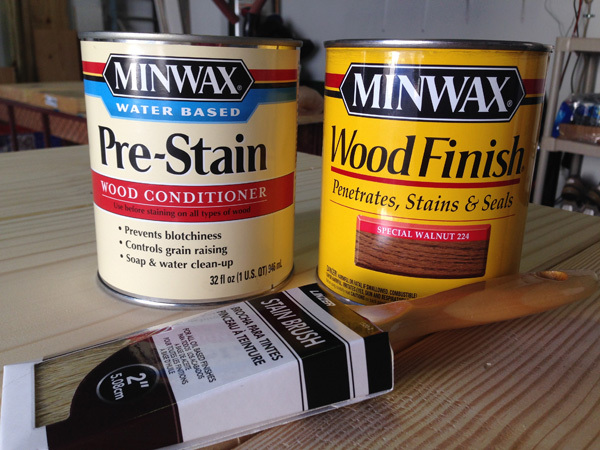 Before applying the actual stain, though, we used Minwax pre-stain wood conditioner. I tested out samples of the wood with and without the conditioner, and the difference was really noticeable once stain was applied. We ended up going with Special Walnut Minwax stain. 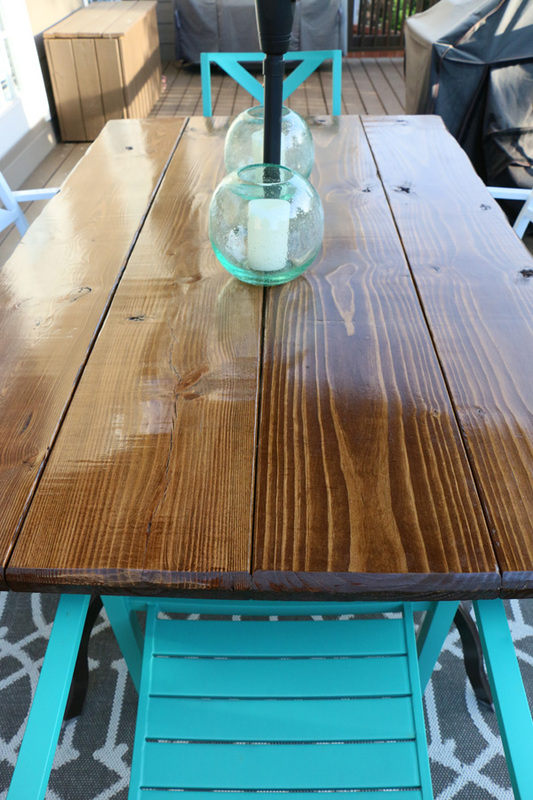 If you haven’t stained wood before, be sure to have a cloth handy for wiping lightly across the surface after each coat. It helps the stain coverage to be more even. We let the table dry at least 24 hours in between each coat. After the first one, I thought that we might not need second, but I’m so glad we did — the color is much more rich and pretty. 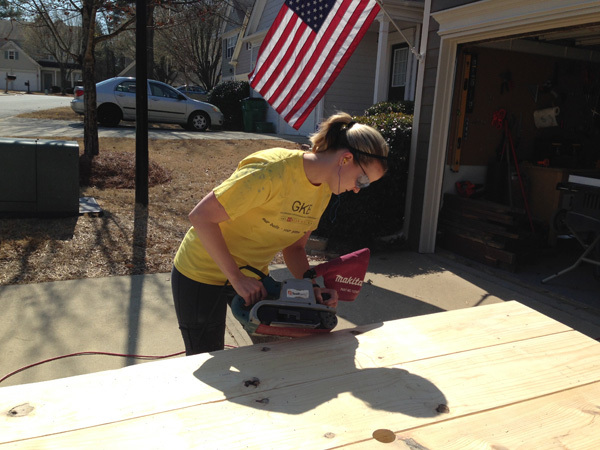 After staining, we wanted to add a couple coats of outdoor-grade varnish to help protect from sun and rain. It took a really long time to find what we needed, but we eventually got it at an Ace Hardware store in town. 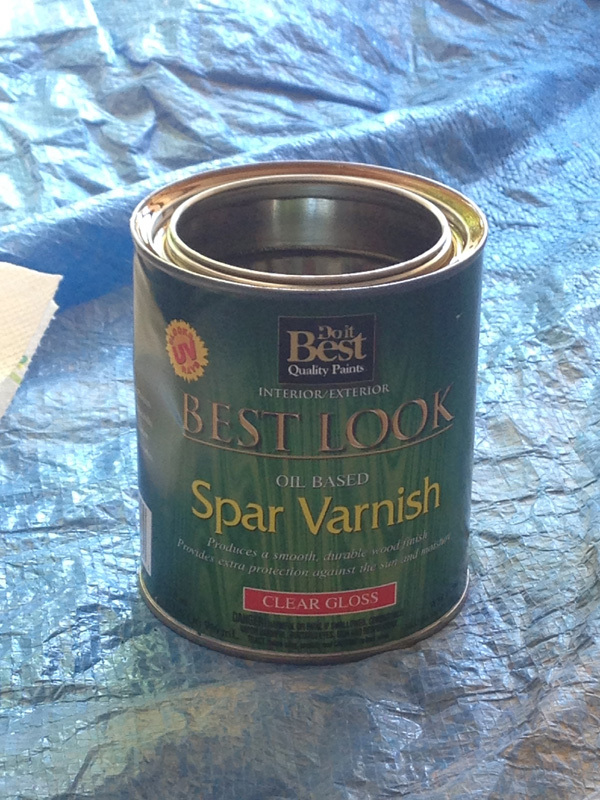 We used Best Look Oil Based Spar Varnish (clear gloss). Be sure to buy a brush specifically made for varnishes so that it has the correct type of bristles and won’t create streaks or leave behind lots of bristles in the sticky varnish. We simply followed the directions on the can and did two coats of this as well, with about 24 hours of drying time in between. We also did a light sanding in between the coats. It’s amazing how much more polished and complete the table looks now that it has a shiny coating on it. And we feel confident that it should withstand the elements. In fact, the day we set it out on the deck, it rained — and the water beaded up beautifully along the top. 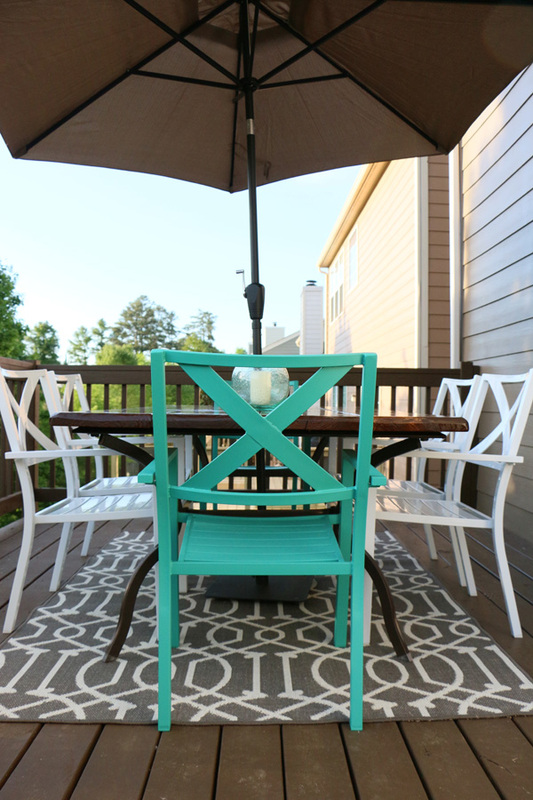 To finish the look for our outdoor dining area, I got an outdoor rug and umbrella at Target. They had lots of colorful options for both, but I chose a more neutral color so that we could have fun with the chairs and table decor. I found these teal green Threshold chairs at Target, but when I went back the next week to buy them, they were gone. So I proceeded on a wild goose chase around the city to find more of these chairs. I finally tracked down 4 white glossy ones and 2 teal green ones (at different stores, of course), so I ran to get them before someone else snatched them up. I love the structure of the chairs, and they’re actually quite comfortable, even without cushions. I also recently picked up these turquoise glass vases at West Elm, which pull in the color of the 2 chairs, and I love the subtle sparkle they have. Instead of real candles, I opted for flameless ones so they will last longer (they’re also from West Elm — they were cheaper than Target, believe it or not). 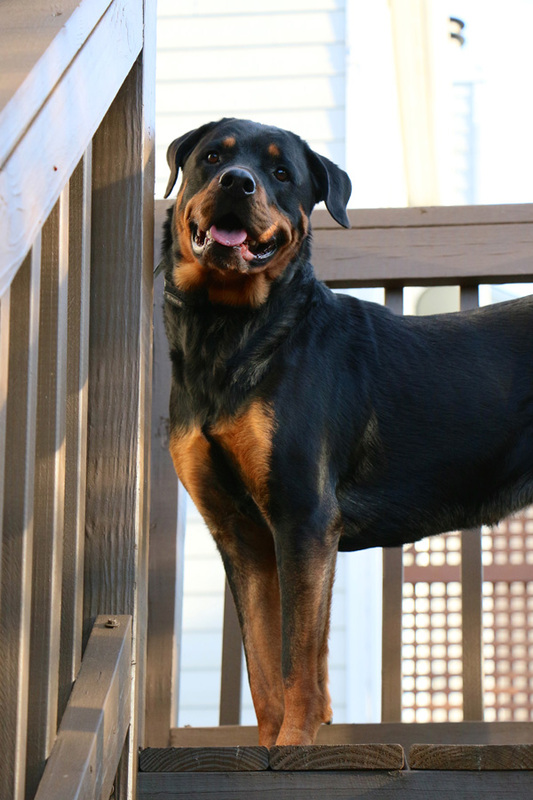 This was a seriously long process, but we’re really happy with the final product. 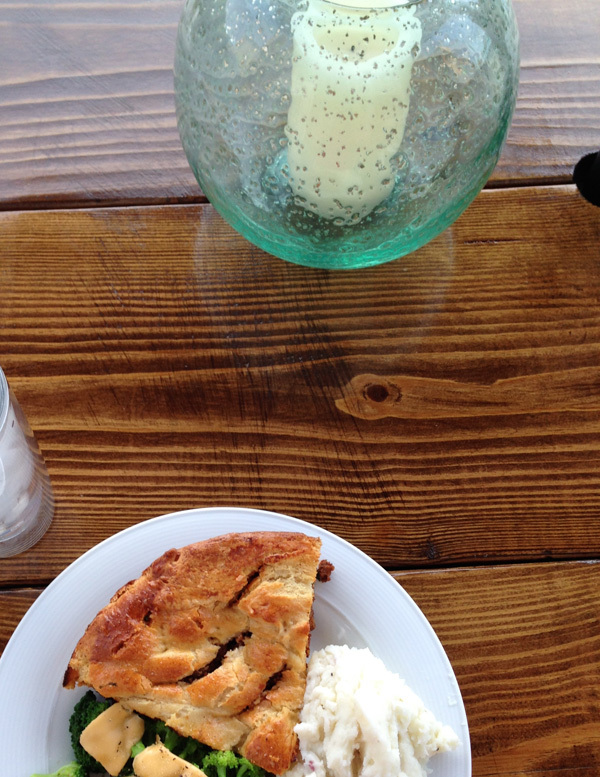 I can’t wait to have some people over for a cookout and dining al fresco before it’s too hot! Coco loves it, too.